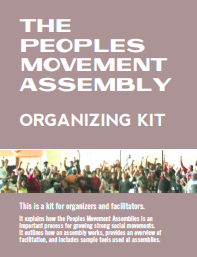 Peoples Movement Assemblies are growing strong social movements. Our movements need new plans of action. Current social, economic, and political systems are designed to fail our communities. The fast-track transfer of public wealth into private institutions reveals the corruption of the governing systems. We need an autonomous, independent social movement with its own social and economic agenda. Social movements are strained. Social movements exist in the US, yet are often disjointed and working separately. We need to build stronger collaborative social movements by deepening our understandings of our common goals and seeking to integrate across issues and regions. This integration is facilitated through convergence. One strategy is not sufficient. Attacks on our communities are part of larger national strategies to dismantle all public infrastructure that nurtures social and economic self-determination. Multiple strategies engage more people and increase our collective potential to respond, fight back, and win. Reforms are not enough; we need to develop long-term vision and strategy. We need to envision alternatives and create new structures to develop the world that we want. We need to develop strategic plans that create short- and medium-term results and lead to long-term systemic social change. Leadership must be held by people who live and experience injustice.Our movements need to continue to be led by people who are affected by social control, racism, and economic displacement. This guiding principle and practice strengthens the effectiveness and integration of our movements. At Assemblies we develop action plans to work together.